It all started sometime ago by one email from my mum. She sent me a random presentation with photos of the Trans Siberian Magistral with one little word, which read: ” Are we going?”. She may have expected the answer “Of course”, what she didn’t expect that it would be now, this year, this Summer, in this year. 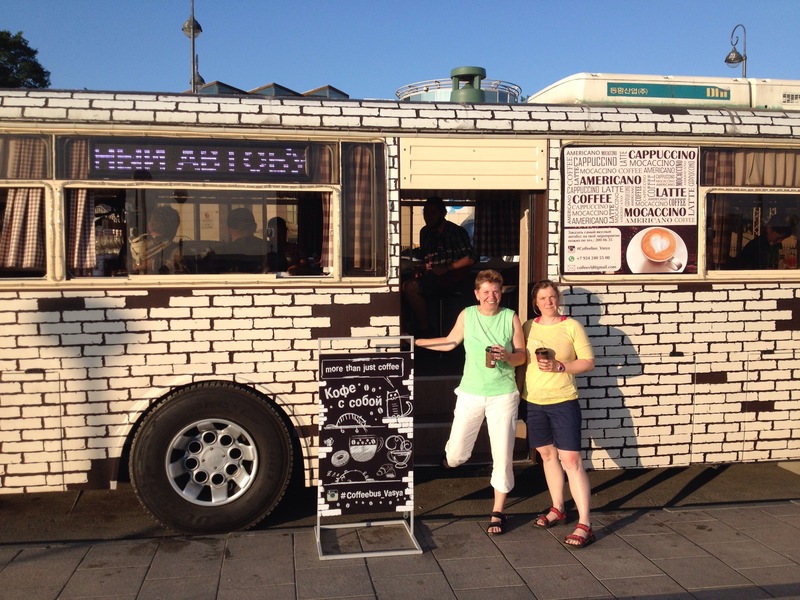 Firstly I had to convince her that the Port of Vladivostok is no longer shut to people from outside. Something many may not realise nowadays, but the town was indeed shut to outsiders, including Russians until mid 1990’s. Next, was to calm her down, that we could get visa and travel freely similarly to what we’ve done last year and no, we won’t need to spend times at police stations trying to register. After that everything was piece of cake. However, our original plan has changed quite a lot. 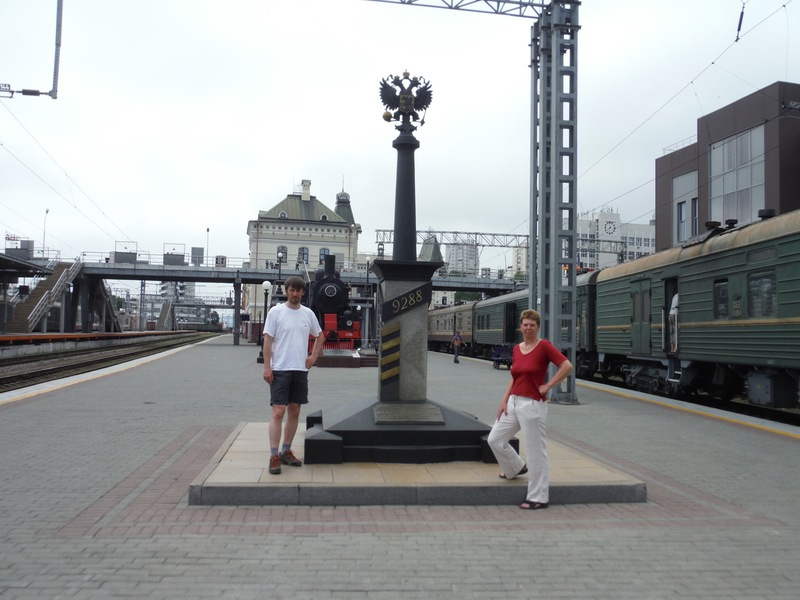 We moved on from the original not so original idea of travelling via the rail from Moscow to Vladivostok to going the other way. And so, one Saturday in July saw us boarding a plane in Prague direction Vladivostok with change in Moscow. We will be travelling from the east towards west via Baikal, taking return flight from Omsk, where ever that is. Although Vladivostok is a fairly new town built in the second half on the 19 century, it escaped the strict linear architecture common in new towns of that era. 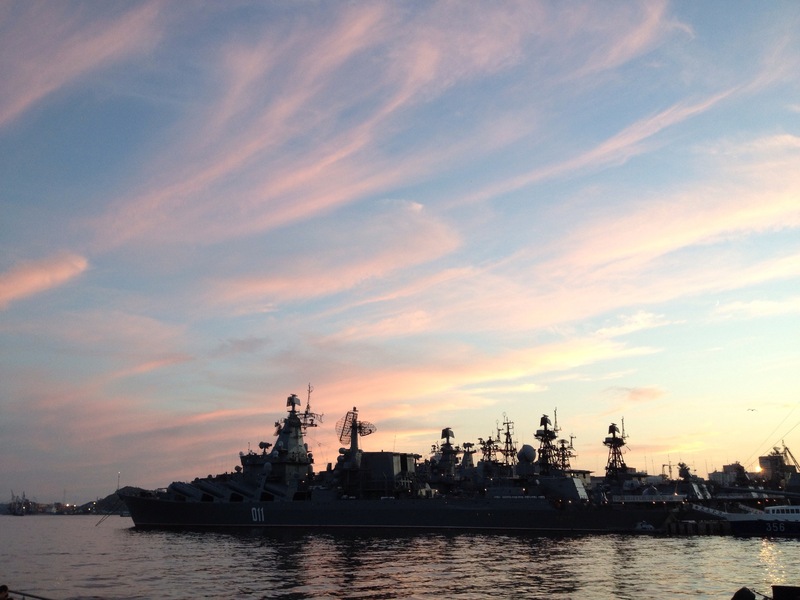 Russian navy reached the Bay of Peter the Great in the 1860 a decided that this natural harbour with its many volcanic hills would be the best for the new port. They were looking for the gateway to the east to the Pacific Ocean. Not wanting to take any risks and following their experiences of loosing Port Arthur to Japan construction of new fortification was started at once. The fortress of Vladivostok was to become the largest in the world and the most modern in its era, only the best military engineers were used. Nowadays parts of the fortress are gone, some are hidden under foliage and others merged with other buildings. The fortification was around the new port, on surrounding hills and islands, mostly Russkyj. It served its purpose and Japan has never managed to take it. The new town quickly became cosmopolitan and attracted new people from all over the world, but also many from its closest neighbours, Japan and China. Before 1936 they all lived in a borough called Millionka named according to the number of people living there. Nowadays the many oriental restaurant remind of their presence. The changes in Russia in the 1920’s and after second world war brought changes to Vladivostok, which became shut to the outside world. This might be the reason why the atmosphere today is so different to other places we’ve visited so far. The town feels calm, yet in the four days we spent here we were not bored once and still there are many places we haven’t seen. 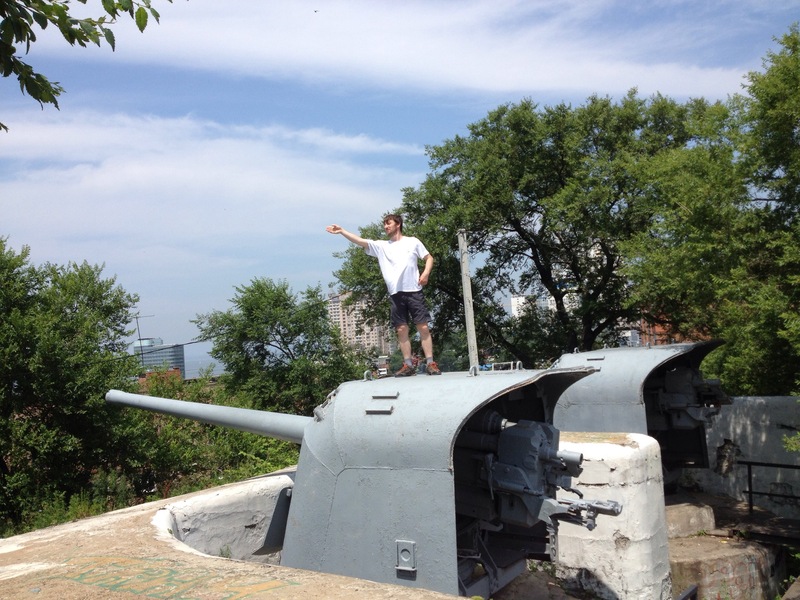 We couldn’t find any tourist guide, but one map, and so our exploration was rather random. Travelling through the town was easy due to its extensive bus network, buses although not always listed on relevant bus stops were frequent, cheap and stopping everywhere. And if we were in any doubt, the locals were always more than happy to help. At some point we just indulged in travelling by random buses through unknown places, yet arriving exactly where we wished to be. 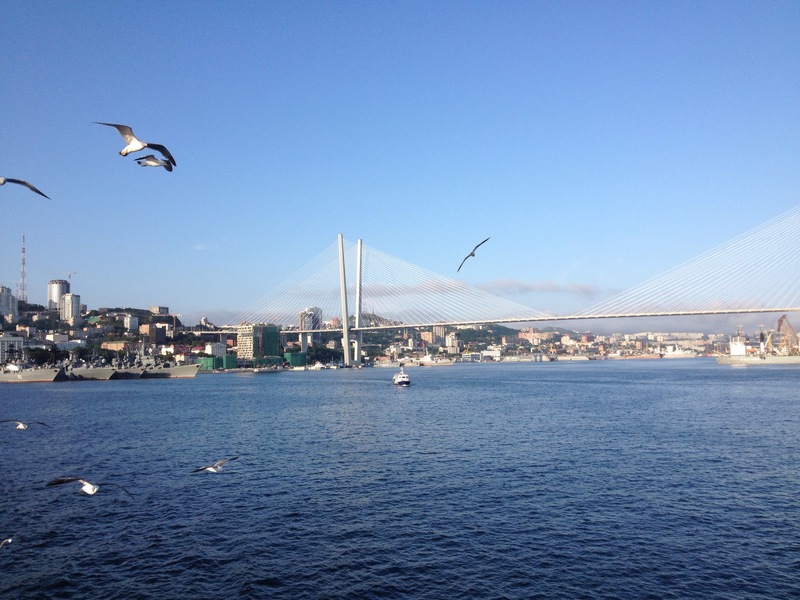 The shores of Vladivostok are washed by three bays, Amur, Ussurij and Golden Horn. Along those are working and naval harbours as well as pebble or sandy beaches, and places to walk, relax, have coffee and beer and so on. The many hills within the town and the two bridges, one across East Bosphor Strait and smaller one across Golden Horn, make the town to be compared with San Fransisco. Yes, we arrived to Vladivostok by plane, yet we couldn’t resist taking photos of the last kilometre of the Trans Siberian Railway. It was started in 1891 and finished in 1916. The train station here is a copy of the one in Moscow. 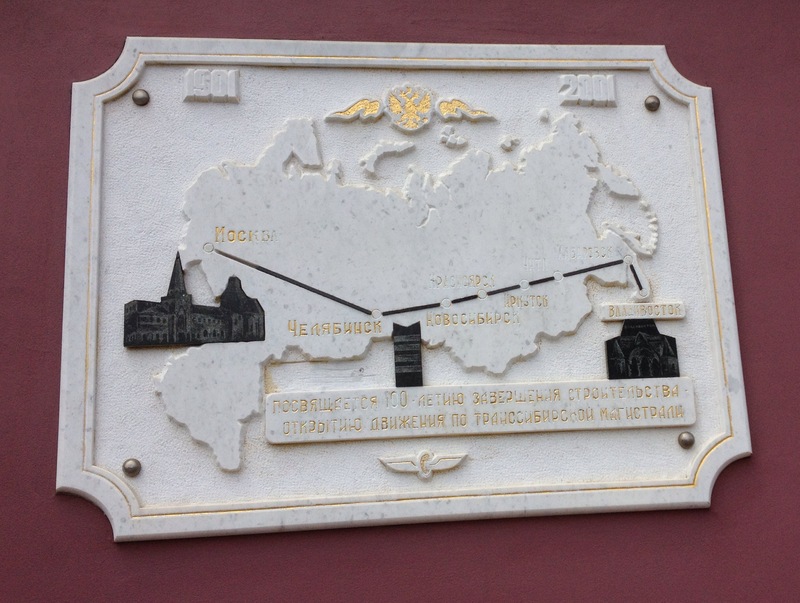 There’s one more thing which is was a bit of a surprise to us, all train tables and time at the station are in Moscow time, some seven hours behind. This entry was posted in Russia by NAtalie. Bookmark the permalink.